This item is exactly what I expected when I ordered. It’s not a plush rug at all but the colors are very balanced and beautiful. Definitely happy with my purchase. 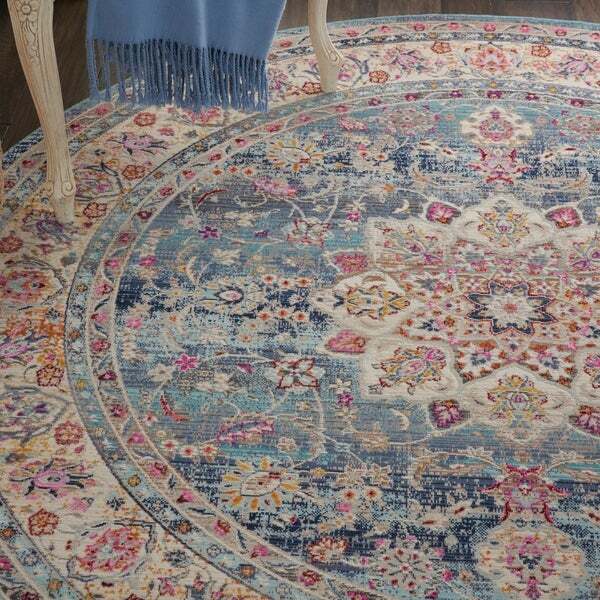 Nourison Vintage Kashan Blue Bohemian Area Rug - 8'10" x 11'10"
The colors in this rug are beautiful, true to the picture online, and soft like a watercolor. The size was perfect; however I gave it 3 stars as it is super thin. 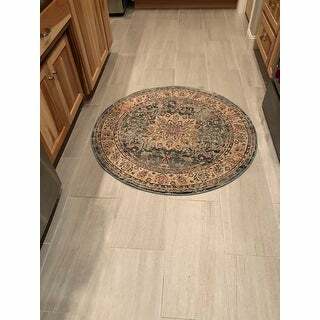 Even with a rug pad it is not of any substantial thickness, especially over my stone floors. I am using for my closet, so will be adequate, but would not consider for any high traffic area or living area due to the thin material. Nice rug! The design and the colors are beautiful. I got the small round size. The only complaint is that the rug is a lot thinner than I expected it to be. Which is fine for my entrance but I’d be upset if i had purchased for a larger area. Overall nice rug but no cushion. 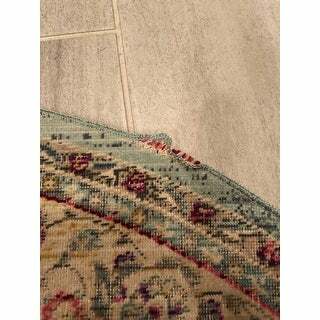 Pretty rug, but very thin and out of round, wavy edges that won't lay down. Much smaller than the 4' pad so had to be trimmed quite a bit. I guess that is why it was on sale for such a low price. Works as an everyday rug by the door for dirty shoes. No, would not recommend. The rug is pretty and the colors are true to the picture, however, it is very thin. Nice looking rug but won't lie flat. Had it upside down for two weeks now and when I flip it over, the edges still curl up. Have to jave it weighted down around the edges to keep it from curling. Nourison Nordic Shag Ivory Area Rug - 5'3" x 7'9"
Nourison Vintage Kashan Blue Bohemian Area Rug - 5'3" x 7'10"